OGN, a Korean esports organization, hosted the grand finals for Overwatch Apex Season 2, and it was a barn-burner. RunAway, a Cinderella story team with no organization, met the titanic Lunatic-Hai, a team whose only loss in the group stage was to RunAway. A mixture of revenge and underdogs, and a grand finals that went the distance. The venue itself was packed with fans, cheering loudly for both teams throughout the night. There were lights, walk-ups and even a karaoke competition between two members of another team, LW Blue. The real event was the Overwatch best-of-seven series, which would determine the best team in Korea. 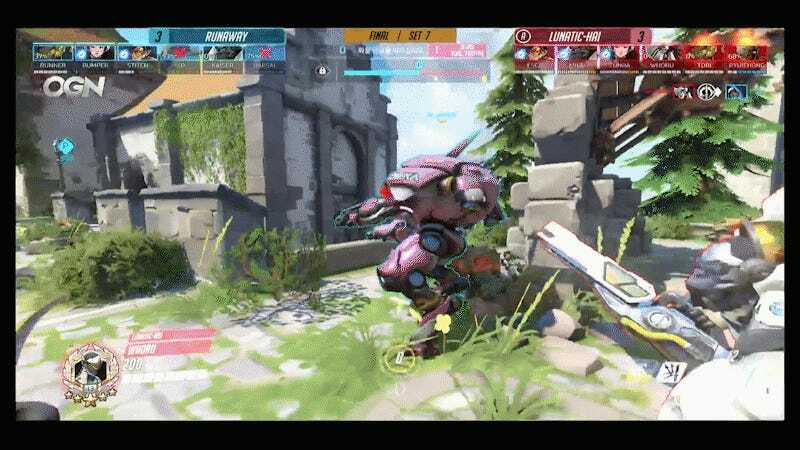 Both squads came out swinging, with clutch plays like a beautiful sleep-dart from Ryu Je-hong of Lunatic-Hai stopping a souped-up Genji in his tracks. Despite that incredible play, Lunatic Hai lost the first two games, putting the underdog RunAway up 2-0. Gong “Miro” Jin-hyuk, Hai’s tank player, showed up in game three with some incredible Winston play to stop the bleeding though, and swing momentum back for Lunatic-Hai. The next match went to RunAway though, and the team was poised to take the series going into game five, with a 3-1 lead. Now, if you’ve seen those numbers before, you know where this is going; in game five, Lunatic-Hai surged back, securing two games in a row to put RunAway on match point. In the final game, both teams played their hearts out, and it came down to whoever could have a player step up and be the hero. For Lunatic-Hai, that was Lee “Whoru” Seung Joon on Genji, who had an incredible game alongside Gong’s Winston. RunAway blew the 3-1 lead, and Lunatic-Hai walked away with ₩100,000,000, or about $85,629, in prize money. For both teams, Apex was an incredible high-note to end the season on, and as Blizzard gears up to announce whatever the Overwatch League will be, you can bet both these teams will be looking to set the standard for global competition.